Vacations are much more than simply destinations. What makes a trip truly unforgettable is the company that you keep. Whether you’re gathering for a family reunion, school trip, or military meeting, the group is what makes the stay great. Nobody welcomes a more diverse collection of groups than Castle Rock Resort and Waterpark. Showcasing an array of amenities, a central location near attractions, and group discounts, this Branson destination allows you to make the most of Missouri. You’ll have plenty to do onsite, as a 30,000-square-foot indoor waterpark and a 10,000-square-foot outdoor waterpark get the entertainment rolling with two 500-gallon tipping buckets, cascading waterfalls, slippery slides, and kiddie pools. Pick up a souvenir at the 24-hour gift shop or grab a bite to eat at the Tower Grill, a casual eatery welcoming everyone for a hot breakfast buffet with a drink, as well as for lunch and dinner. Blow out the candles with a Splash Bash Birthday Party. You can invite up to 10 guests to your pool party, which includes access to the waterpark for the day, a complimentary party room, a personalized birthday cake, and a surprise for the birthday boy or girl. The fun continues just off-site, where restaurants and attractions abound. Explore the stores at Tanger Outlets, where world-class shopping includes such stops as Express, Chico’s, and Gap. Stop by the Ozark Mountains every season and observe the vibrant fall foliage, spread some cheer at the Ozark Mountain Christmas, or check out dozens of live shows. Special rates apply for motorcoach and tour groups exploring the area. 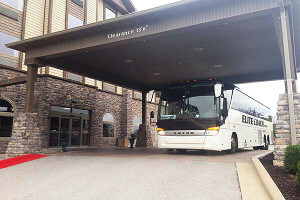 Additional group perks include baggage handling services, complimentary bus parking, and convenient group check-in with pre-made keys or individual group member check-in options. All of this comes with discounted group rates. In fact, visitors will receive one complimentary guest room for every 20 guest rooms that actualize. The rates may be discounted but the accommodations are still exceptional. 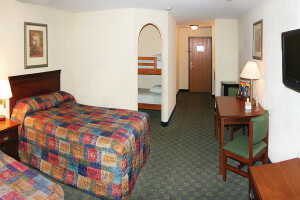 Spacious rooms offer the choice of either two double beds or one king-size bed with a bunk. Enjoy amenities like a flat-screen television, in-room coffee maker, hair dryer, and much more. The Atrium rooms display newly renovated units with tasteful decor and 36-inch flat-screen televisions. The options are truly endless here. Onsite entertainment, nearby attractions, and outstanding accommodations make Castle Rock Resort and Waterpark your premier group getaway.